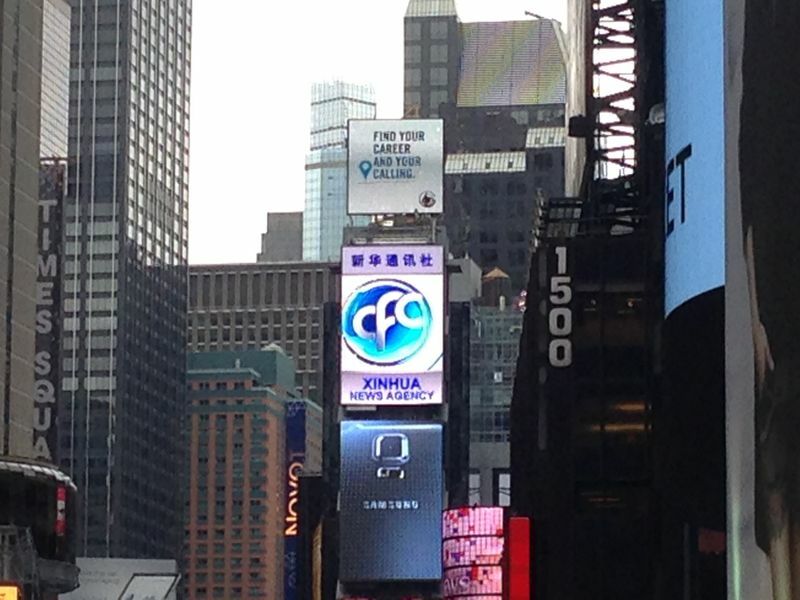 A Xinhua billboard in Times Square. Japanese companies are no longer as prominent as they used to be. NEW YORK — It might not surprise anyone to learn that China’s state-owned broadcaster CCTV America more or less ignored Hong Kong’s democracy protestors, except to note police injuries by “aggressive” activists. Nor would Americans be shocked to read in China Daily — available for free in towns like Boston and Washington DC — that China has historical claims over the entire South China Sea. Few Americans without links to Asia may be aware of it, but in the airwaves and on the ground, Japan, China and South Korea are engaged in a soft power scrum to get Americans to see territorial and historical issues their way. So how do Japan’s efforts stack up in the court of public opinion in its key ally the U.S.? When it comes to propagandizing by state media outlets, China’s media blitz blows Japan and Korea’s out of the water. The Xinhua news agency staked its claim in the Western media space with a 40 by 60 foot billboard in Times Square in 2011. CCTV has embarked on a hiring blitz that now sees its CCTV America channel fronted by onetime CBS anchor and USA Today correspondent Mike Walter. But China and Japan’s strenuous English-language media efforts sometimes result in an own-goal. NHK’s guidelines on the Senkakus have been given rough treatment in the Western press, and the broadcaster didn’t exactly endear itself to Americans when one of Prime Minister Abe’s new board picks reportedly termed the World War II Tokyo tribunal a “cover-up” of American atrocities. Supplementing their media organs, northeast Asian countries also lavish support on cultural foundations. China in recent years established numerous Confucius Institutes worldwide including some in the U.S. These have become the subject of controversy over accusations they are stifling free academic debate on subjects sensitive to the country. Japan has the Japan Foundation for academic and cultural endeavors, and a new billion-dollar fund to support Cool Japan industries like anime and manga. South Korea has the Northeast Asian History Foundation, which supports books and conferences in the U.S. on issues of history relevant to Korea, and has played a key role in telling the Korean side of the story on disputes with both Japan and China. Asian and other countries also spend millions trying to influence policy by funding U.S. think tanks, such as Japan’s contributions to the Center for Strategic and International Studies. This backing recently sparked congressional demands for a Justice Department investigation over worries about its potential to warp policy debate on the US approach to trade and security in Asia. When it comes to pop culture and entertainment, China, Japan and Korea mostly have better luck in their campaigns to win friends and influence people. At street level, Japan funds a wide range of well-attended events such as the Japan Day in New York’s Central Park, while young Japanese and Americans have rich exchanges in the pop culture sphere. Chinese pop culture has had some noted successes in film and the performing arts, although in the fine arts the country’s best-known figure is the defiant Ai Weiwei. Without the large markets of its northeastern Asian rivals, South Korea has to look abroad; the success of Psy and Korean soaps are the products of Korean global media savvy, and K-pop acts play to crowded houses in the U.S.
And CCTV, NHK and South Korea’s KBS all do a better job at broadcasting documentaries and cultural programming than they do at hard news. So with all the state money and sweat being expended on soft power, are the Asian powers’ American friends being won over? Kingston is blunt in his appraisal of the tide of Chinese cash being funneled into the media and Confucius Institutes. But Chinese soft power may have a subtler lure for some — the very success of its governance model. For the moment, China, Japan and Korea’s soft power campaigns seem likely to have about as much effect shaping US policy as, say, Qatar-owned Al Jazeera is having influencing Western public opinion. It’s likely that the news of the day coming from Asia on CNN and in the New York Times et al has a far greater impact than any Asian soft power effort. And it’s here where China’s thrusts into waters near Southeast Asia and Japan have likely soured Americans on the country. A recent survey by the Chicago Council On Global Affairs shows Americans ranking Japan at 62 on a 0-100 favorability scale, with China at 44. More Americans than in the last 2012 survey favored building relations with traditional allies like Japan and South Korea, even if that means diminishing relations China. Disturbingly, despite a U.S. commitment to defend the Senkakus, it’s questionable how many Americans are even aware of the stakes. This, after all, is a country where each day thousands happily eat sushi without realizing the restaurants they’re seated at are owned and staffed by Chinese people. Manga, anime, J-pop – once it was all about Japan. But the country’s efforts to channel its ‘cool’ as part of a global soft power strategy may need a revamp amid intense competition from Korea.